Today, I start reading Ernest Hemingway’s second novel, The Sun Also Rises, which is about the “Lost Generation” (American ex-pats living in France and Spain in the 1920s). This is the novel that put Hemingway on the map. So I look forward to delving into it. 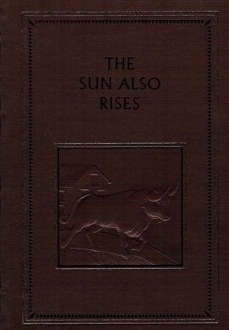 Although I thought The Torrents of Spring was interesting, I hope The Sun Also Rises is a little less Kafka-esque. I should note that The Sun Also Rises was made into a movie in 1957 that sports an all-star cast (Errol Flynn, Tyrone Power, Ava Gardner, Mel Ferrer, Eddie Albert). I intend to watch it – after I read the book, of course. You can call me Ernie. But don't expect me to answer to that. I woke up one morning and decided I needed to accomplish a few things before my next birthday. Call it what you will - a flight of fancy? A hankerin' to read Hemingway? My mid-life crisis? Some people climb mountains. Some jump out of planes. I decided to spend time -- 70 days, in fact -- with the man called "the most influential writer of the last century." I don't know what's going to happen here. Maybe nothing. Maybe something magical. I have no idea. But here's the deal: While I read Hemingway's classic books (all 10 of 'em back to back, in order, starting with the first), I won't read anything else. No other books. No newspapers. No magazines. Nope. It's all Ernest, all the time. My 70 Days With Hemingway begins June 10th and ends August 18th, 2009. Daiquiri – Hemingway's "drink of choice"
See Ya Around, Ernest. It’s Been Fun. The Last Hemingway Book – True! Paul on Oh, Ernie, I Failed Ye! Let Me Buy Ye An Absinthe to Make it Up to Ye! Tom on See Ya Around, Ernest. It’s Been Fun.